bridal jewellery, tiaras and accessories. Sparkling new collections from 16 leading designers are complemented by wonderful floral displays by renowned wedding florist Diane Penny and beautiful photography from the award-winning reportage photographer Karen Turner. This creative collaboration between three well-known Yorkshire businesses offers an abundance of ideas and inspiration for planning the perfect wedding day. The exhibition features work by sought-after gallery favourites and specially selected designers who are being shown at the gallery for the first time. Long-time Gallery favourite and ‘jeweller to the stars’, Malcolm Morris, presents an entirely new collection of rings and tiaras, which will be displayed exclusively at the show. Known for the tiara he created for Gwyneth Paltrow in ‘Shakespeare in Love’, Malcolm has designed jewellery for a number of other film and TV productions as well as for celebrity clients including Dawn French and Joan Collins. Other popular Gallery exhibitors include Catherine Mannheim’s classic rings with their ancient treasure-like qualities, made more beautiful by the unique patina they develop as they are worn. Kate Smith launches her new ‘Precious’ range of rings and earrings which are ‘studded’ with tiny holes and set with myriad sparkling diamonds, whilst James Newman’s cool collection of classic, elegant rings for men is crafted in gold, silver or platinum. Brand new to the Gallery, jewellery with a real personal touch, Tanja Ufer’s ‘Lover’s Rings’ offer the chance to have your own jewellery melted and recreated into a special contemporary love symbol. Her collection also includes a series called ‘Rough Cuts’ - rings that cleverly combine ‘industrial’ styling with precious jewels. By contrast, Ruth Tomlinson uses fired porcelain to create her magical collection of gold and silver rings, neckpieces and tiaras, featuring clusters of handmade porcelain flowers which can be made to the colour of your choice. Also exhibiting at the gallery for the first time, Jean Scott-Moncrieff has used glowing orange fire opals and other richly coloured precious stones to craft sumptuous golden rings and earrings, with echoes of ancient artefacts. Shimara Carlow creates beautiful tiaras, chokers, rings and earrings from delicate strands of frosted silver, twined and decorated with 18ct gold daisy cups - perfect for brides and bridesmaids. Maike Dahl shows her twist on traditional pearls, with elegant necklaces made from delicate seed pearls – which literally have a ‘twist’ in them. For a sleek engineered look, Ruth Bridges’ masculine collection of rings and cufflinks use matt white gold inlaid with slivers of silver set with tiny diamonds. Collections by Yorkshire designers include Sarah Lawrence’s new range of fairytale tiaras in silver, pearls and crystals, and Fiona Mackay’s stunning rings, earrings and pendants, made with gorgeous pink sapphires and diamonds, interwoven amongst fine white gold branches. Fiona has also designed an exquisite range of seed pearl and silver jewellery perfect for bridesmaids. Deb Price crafts quirky, one-off tiaras, bags and wedding favours, using vintage fabrics, buttons and beads. Her heart-shaped, hand-felted brooches make lovely Valentine’s gifts. 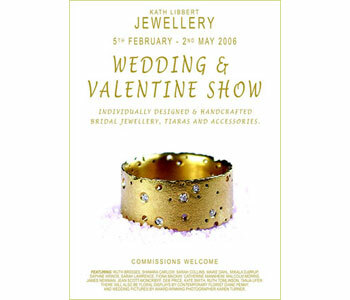 Artists featured in 'Wedding & Valentine Show' are: Ruth Bridges; Shimara Carlow; Sarah Collins; Maike Dahl; Mikala Djorup; Daphne Krinos; Sarah Lawrence; Fiona MacKay; Catherine Mannheim; Malcolm Morris; James Newman; Jean Scott-Moncrieff; Deb Price; Kate Smith; Ruth Tomlinson; Tanja Ufer.